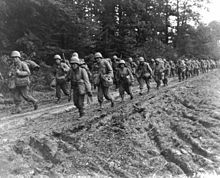 The 442nd Regimental Combat Team hiking up a muddy French road in the Chambois Sector, France, in late 1944. The 442nd Regimental Combat Team (Japanese: 第442連隊戦闘団) of the United States Army was a regimental size fighting unit. It was composed almost entirely of American soldiers of Japanese descent. These men volunteered to fight in World War II even though their families were subject to internment. The 442nd, beginning in 1944, fought primarily in Europe during World War II. The 442nd was a self-sufficient force. It fought with uncommon distinction in Italy, southern France, and Germany. The 442nd is considered to be the most decorated infantry regiment in the history of the United States Army. The 442nd was awarded eight Presidential Unit Citations and twenty-one of its members were awarded the Medal of Honor for World War II. The 442nd Regimental Combat Team motto was, "Go for Broke". ↑ "Asian-Americans i the United States Military during the Korean War". State of New Jersey. Retrieved January 1, 2013. ↑ "100th Battalion, 442nd Infantry". GlobalSecurity.org. 23 May 2005. Archived from the original on 11 September 2008. Retrieved January 1, 2013. ↑ "Title unknown". Retrieved January 1, 2013. Asahina, Robert (2007). Just Americans: How Japanese Americans Won a War at Home and Abroad. Gotham Books. ISBN 978-1-59240-300-4. Chang, Thelma (November 1985). I Can Never Forget: Men of the 100th/442nd. Honolulu, HI: Sigi Productions. ISBN 978-0-9630228-0-6. Crost, Lyn (1994). Honor by Fire: Japanese Americans at War in Europe and the Pacific. Novato, CA: Presidio Press. ISBN 978-0-89141-521-3. Katz, Robert (August 2003). The Battle for Rome: The Germans, the Allies, the Partisans, and the Pope, September 1943–June 1944. New York: Simon & Schuster. ISBN 978-0-7432-1642-5. Moulin, Pierre (2007). Dachau, Holocaust, and US Samurais: Nisei Soldiers First in Dachau?. AuthorHouse. ISBN 1-4259-3801-9. Ready, J. Lee. (1985a). Forgotten Allies: The Military Contribution of the Colonies, Exiled Governments and Lesser Powers to the Allied Victory in World War II. Jefferson, North Carolina: McFarland & Company. ISBN 978-0-89950-117-8. Ready, J. Lee (1985b). Forgotten Allies: The European Theatre. Jefferson, North Carolina: McFarland & Company. ISBN 978-0-89950-129-1. Shirey, Orville C. (1990). Americans: The Story of the 442d Combat Team (3 ed.). Washington: Infantry Journal Press. Steidl, Franz (2000). Lost Battalion. Novato: Presidio Press. Sterner, C. Douglas (2008). Go For Broke. Clearfield: American Legacy Historical Press. Go For Broke National Education Center (29 December 2005). "Colonel Young Oak Kim (U.S. Army Ret. ), 86; Decorated U.S. WWII And Korean War Veteran". Press release. http://www.goforbroke.org/about_us/about_us_news_press010306.asp. Retrieved January 1, 2013. United States Department of Defense (19 May 2000). "21 Asian American World War II Vets to Get Medal of Honor". Press release. http://www.defenselink.mil/news/newsarticle.aspx?id=45192. Retrieved January 1, 2013. Wikimedia Commons has media related to 442nd Infantry Regiment (United States). The Story of the 442nd Combat Team compiled by members of the 442nd Combat Team, Mitsuye Yamada papers, Special Collections and Archives, The UC Irvine Libraries, via Calisphere. "From a Quiet American, a Story of War and Remembrance". The New York Times. 16 August 2008. A Path to Lunch Liberation Day and the Liberation of America, the 442nd in Lunigiana and Versilia. This page was last changed on 18 January 2019, at 00:15.